What Features Does SMS-Peeper Have? How Do I Install SMS-Peeper? Is It Legal To Use SMS-Peeper? With the latest technologies, parents can easily stay updated on what’s going in the lives of their kids. By viewing Instagram feed one can find out what images the child posts. Facebook can also tell you who uploads a photo with your child on it. But, what about text messages? If you have an account, you can always supervise the activity of your children on social media. But you can’t read your daughter SMS without a special tool. SMS-peeper is the service that can help you discover the contents of your kid’s texts. Read our review to find out whether the SMS-peeper works. SMS-peeper is the website, which interacts with your kid’s smartphone and reflects the text messages both sent and received. The system can monitor up to 100 texts messages. The half of them are incoming, and the other half – outgoing. The SMS-peeper service captures the sent and received messages. Then SMS-peeper presents the list of messages along with phone numbers of recipients and senders. The service also reflects other details such as the time when the messages were sent/received. You also can read the complete text of the message. A person, whose texts are captured by SMS-peeper will never find out about it. SMS-peeper is completely undetectable. To start catching messages with this tool, you only need to enter their website. To trigger the messages monitoring, you need to enter some info on the website. Define your country, add e-mail. Paste the phone number of someone whose texts you are up to read. After that, click Get messages and wait till the SMS-peeper intercepts the content of each text. Then you will need to enter download code in the field provided. The site redirects you to another website where you can download code and be able to see the content of 100 messages captured. But the process seems too suspicious: we wouldn’t recommend you to trust the unknown website, the SMS-peeper redirects you to. SMS-peeper has a limited feature set. It doesn’t allow to monitor the whole scope of activity on the target device. So, for your understanding of what features an excellent parental control solution should provide; let’s look on the list of options unavailable for SMS-peeper users. 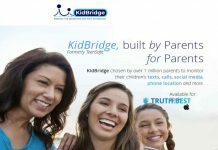 You can’t monitor social media apps – Most of the parental controls allow parents to detect what kind of activity their children perform on social media. Unfortunately, SMS-peeper leaves social media apps out of account. You can read your child’s messages on messaging platforms like Snapchat or WhatsApp. You can’t track kid’s location – The real benefit of the monitoring your child’s smartphone is the possibility to know their location. Many parental controls allow to find out someone’s exact GPS location. Some of them also provide geofencing services. But, SMS-peeper doesn’t cover GPS tracker. You can find out anyone’s location with this tool. You can’t view browsing history – Some monitoring applications feature keylogger option, which allows to find out what websites your child searches for instantly or anything else they type on the keyboard of their device. Keylogger is another feature SMS-peeper doesn’t provide. SMS-peeper is the tool, which requires no installation on the target device. It is not the type of mobile software that runs on the smartphone or any other device. SMS-peeper is a website you can use to track anyone’s messages. It is entirely legal to use SMS-peeper as long as the owner of the device is notified that you intend to read their messages. The owner also has to provide you with the proper consent that they have objections of the monitoring tool scanning their private messages. It is important to note that SMS-peeper doesn’t provide valid information on the legal use of their tool. We can only guess how to use the website correctly. Having examined the tool thoroughly, we can claim that it doesn't run successfully. After the service ends intercepting texts, the system shows database error. That's why we can't recommend the tool for anyone.